''In spite of a lot of good natured kidding from his co0workers, jack has delved seriously into a study of traditional folk ballads as a background for his efforts at creating new stories to be told in updated folk style''. This must have stood a fair chance of success in the pop sweepstake. The prominently mic'd brushwork provides a fine drive to the record in much the same way that the deadened acoustic guitar underpinned many of Johnny Cash's best recordings with a similar sound. added at an overdub session in November 1958. 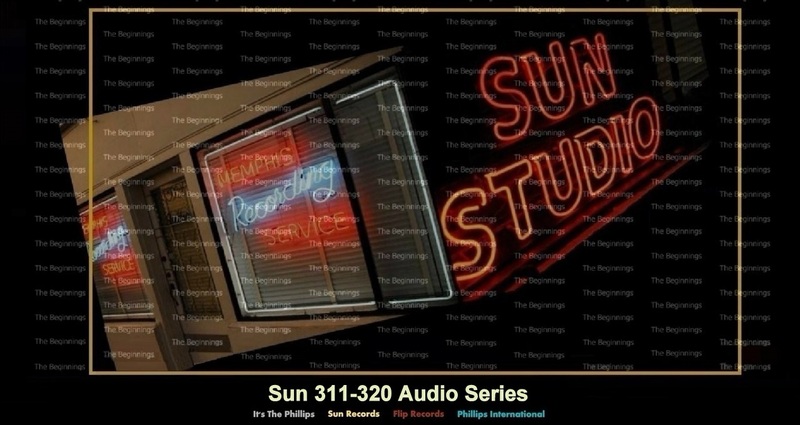 It was at Jerry Lee's insistence that this record (SUN 312) was cut and released on Sun. If nothing else, it should put to rest any doubts about the influence Moon Mullican had on the Killer's style. Resurrechting "I'll Sail My Ship Alone" may have been a fine tribute to Mullican, bit it did little to energize Jerry Lee's career. The original idea for a rocked-up version of "Down By The Riverside" came from Memphis Press Scimitar reporter Edwin Howard who had recorded one single for Sam Phillips in order to document the process of recording. In the first flush of enthusiasm after its release, Howard re-wrote the lyrics to "Down By The Riverside" and was given 50% of the song after Riley subsequently copped the idea. Bill Justis overdubbed a chorus and a second sax part over the bed track which went some distance towards disguising Riley's somewhat lackluster vocal. Jimmy M. Van Eaton recalls, ''A lot of stuff, some of which you've probably discovered going through the tapes, was never intended to be released. With Jerry Lee, that was how we did 80%, maybe more of the sessions. You'd just start jamming and Sam has the tape running. That's why with Jerry Lee there were often no arrangements, no beginnings, no endings. On "Lovin' Up A Storm", the writers have taken meteorological rock to its pinnacle and Jerry's vocal and piano are duly frenzied. The rhythmic hook gives the song some powerful appeal, but the result are a bit too studied to be among Jerry's best work. Even so, the record deserved more of a response than it got. It's interesting that while many Sun sessions were calming down considerably by January 1959 and sweetening the result with strings and voices. Jerry Lee, Roland Janes and Jimmy van Eaton were still pounding away as if the calendar on the wall said 1957. ''Lovin' Up A Storm'' is a particular showcase for Jimmy M. Van Eaton. The powerful stop-rhythm drum into and those two-bar single-stroke rolls into the chorus mark this record as special. "Sail Away" is a less gimmicky and highly effective outing for Smith. Here, the vocalist duets with his regular guitarist, Stanley Walker, in a Charlie Rich tune. Rich's influence can be heard in some powerful lyrical images ("I may find joy in some green valley / be a bum, live in an alley") as well as his omnipresent piano. No matter how you slice it, this is an anti love song. The feeling may be fairly universal, but the marketplace has rarely opened its arms to a lament saying "whatever it takes to get away from you, I'm all for it". Ray Smith confirmed what a powerful vocalist he was on both of his March 1959 release (SUN 319). Given the novelty value of "Rockin' Bandit", it is really surprising that the disc met with little success. The very same gunshot effects had appeared on the pop charts the previous year in the Olympics' record of Western Movies. Maybe teenagers were tired of being shot at. "Rockin' Bandit" was composed by a local teenager named Ira Lichterman, who emerged as a Sun artist in his own right in November, 1960.